The most elite squad of Peel Police officers is led by a lady in grey. “I love it,” said Staff Sgt. Dawn Orr. Orr first joined the tactical team in 1998 as a constable, leaving as an acting sergeant. She was promoted last March and is now commanding the unit’s 37 members. Known as SWAT stateside, tactical and rescue officers respond to high-risk incidents involving hostages, barricaded persons, or any situation with a firearm or weapon. Members of the unit – donning grey uniforms – are highly trained in firearms, hostage rescue, rappelling, sniper interdiction, and the like. In other words, they’re the best of the best. Excelling comes naturally to Orr, who has been swimming competitively since the age of six. That kept her busy and “I didn’t have any opportunities to get into any trouble,” she said. Orr still swims on a master’s team four days a week. 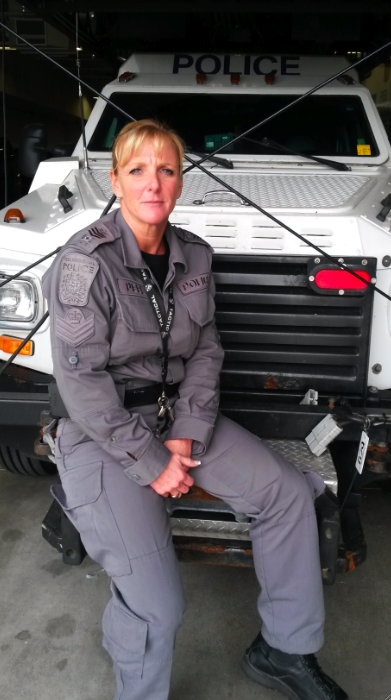 She grew up in a police household in Brampton, and has spent her 25-year career in Peel, starting as a cadet. Discipline comes with the territory. Much like colleague Const. Jennifer Dagg from the K9 unit, Orr said mental toughness is valued over muscle. Canadian series Flashpoint, which aired from 2008 until 2012, often depicted the fictional tactical squad covering all aspects of a case. “That’s not as accurate,” said Orr, noting investigators would be the ones interviewing witnesses then feeding the information to the tactical squad to carry out the plan. “I wouldn’t leave my lineup at the door to go and talk to someone down the street about what they saw yesterday,” she said. The unglamorous side of the job involves staying alert and controlling your breathing for “several hours where there’s a negotiation process,” she said. Using rams or “making entry” may happen six hours into a standoff. “Even after that long period of time, going in and actually executing whatever assignment you have properly” requires peak mental acuity, Orr said. Officers train for every possible scenario, “so I think you’re always prepared,” said Orr. Motherhood, though, comes with hockey equipment. Spending time with her two pre-teen boys “is my change from being a ‘police mom’ to a mom,” Orr said. Last weekend, she attended a hockey competition. “My son won the tournament. That’s fun for me,” said Orr. She also finds solace in the pool and the gym. “So I guess my relaxation and my fun, they’re the same,” she laughed. Her older son is hinting at becoming a police officer, but Orr isn’t holding her breath. “They want to be in the NHL,” she said. Orr’s younger brother, Stephen Clarke, won a bronze medal at the Barcelona Olympics as part of a swim team, and competed at the 1996 Summer Games in Atlanta. Clarke is an officer with Peel Police’s criminal investigations bureau. Women in policing: Five officers are sharing their stories during a presentation on Sat. Nov. 28 at 180 Derry Rd. E.
The event takes place from 8:30 a.m. until 12:30 p.m.
Register by email: recruitingbureau@peelpolice.ca or call 905-453-3311 ext. 3840.